Porsche and the new 911 GT3 RSR did well at Sebring in the World Endurance Championship, but podium for the ALMS GT class was not to be. Porsche fan favorite, the No. 45 Flying Lizard racing Porsche, was pretty much knocked out of the race before it even started. At the green flag, before even crossing the starting line, the No. 45 sat grounded on the track for nearly 30 minutes after being hit from behind by the No. 58 Luxury Racing Ferrari. Towed to the pits, it was nearly another 30 minutes to fix the severe rear suspension damage caused by the accident. Joerg Bergmeister drove the Porsche back into the race just under the one hour mark, but had lost 26 laps on the GT leader as a result. Fortunately, the Flying Lizard team was able to complete enough laps to earn 10th place points toward the overall championship. In the end, Porsche's best finish in the ALMS GT class would be 5th place by Paul Miller Racing. If you can't see the video below, you can watch it on our site in the post Pictures, Video and Results for Porsche a the 2012 12 Hours of Sebring. Fortunately, Porsche fared better in the World Endurance Championship with a second place finish in the GTE Pro class by Porsche works drivers Marc Lieb (Germany), Richard Lietz (Austria) and Patrick Pilet in the Felbermayr-Proton team Porsche and a first place finish by Christian Ried (Germany) and his Italian teammates Gianluca Roda and Paolo Ruberti in the second Porsche 911 GT3 RSR (2011 model year) run by Felbermayr-Proton in the GTE Am class. Complete results for the classes Porsche participates in are at the end of this post, after the pictures. Round two of the World Endurance Championship takes place on 5 May 2012 in Spa-Francorchamps/Belgium. Round two of the American Le Mans Series takes off on the street course in Long Beach, California Round two of the World Endurance Championship takes place on 5 May 2012 in Spa-Francorchamps/Belgium on April 14th. See our post explaining the World Endurance Challenge if you're confused as to the different classes and different championships. If you're viewing this post via email you may want to visit our post, pictures and results for Porsche at the 2012 12 Hours of Sebring, directly on our site to make use of the gallery function for viewing the pictures. 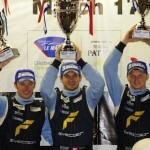 How Much Money Can You Win for Getting on the Podium at the 12 Hours of Sebring? Am I missing something or do the WEC Porsches seem more “reliable” than ALMS GT-class Porsches? Define reliable? Do you mean actual mechanical reliability? Or, are you speaking figuratively about their ability to complete the race and get on podium? Mechanical – maybe more factory attention is given to the WEC cars/teams?